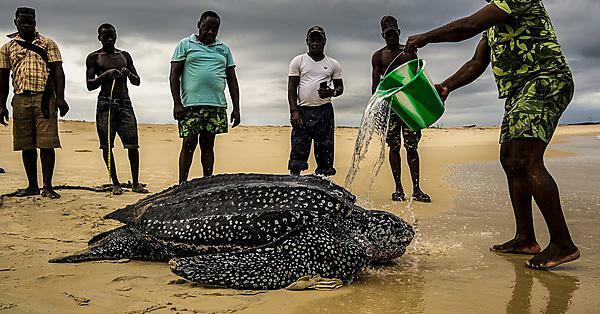 A University of Plymouth postgraduate student has won national recognition for a photograph of a rescued female leatherback turtle in Gabon, West Africa. Adam Rees has been chosen as the student winner in the Ecology and Society category of the British Ecological Society (BES) annual photography competition. Adam recently submitted his PhD thesis, looking at the ecological impacts of commercial potting on seabed habitats in the Lyme Bay marine protected area. While not directly related to his studies, it was a love of all things marine and wildlife that took him to Gabon in February this year. A perfect place to track leatherback turtle hatchlings, Adam travelled to the country to help in a project run by German ocean research unit GEOMAR. And it was early one morning, before beginning the day’s fieldwork studying the period between hatching and early adulthood in the charismatic creatures, that he got involved in a rescue and captured his prize-winning picture in the process. Adam said: ‘We received a call at sunrise from the local Gabonese Agence Nationale des Parcs Nationaux officers to say a female leatherback turtle (Dermochelys coriacea) had got herself into trouble overnight. She was late in the season, and desperate to lay her clutch on her home beach at Point Denis, near Gabon’s capital Libreville. Unfortunately, after hauling herself onto the sand she had carried on inland for some reason, before realising her mistake, she tried to return to the water. ‘Photosensitive leatherback turtles rely on lunar cues for their navigation, and the newly developed lights of Point Denis against the backdrop of bustling Libreville overpower the night sky. So many adult turtles are drawn towards the dangerous city, rather than back out into the ocean. ‘We found this leatherback over 500m inland, blisters on her flippers and severely dehydrated, still heading the wrong way. With the help of more than ten people and a large rope, we managed to turn her around and help her back to the water. The BES competition, Capturing Ecology, celebrates the worldwide wealth of flora and fauna, with subjects ranging from predators capturing and devouring their prey to woodland scenes. BES executive director Dr Hazel Norman said: ‘Our judges had a difficult task to choose from many impressive entries this year. Some of the images demonstrated interactions between different species in their natural environment, which can be complex and difficult to capture. The winning images will be exhibited this month at Ecology across Borders in Ghent, Belgium, an international conference bringing together 1,500 scientists from 60 countries to discuss the latest advances in ecological research.